A MILLION WATTS OF FUN! 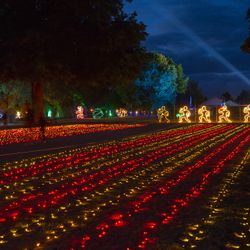 A fairyland of 500,000 sparkling lights envelope lake-side walkways. 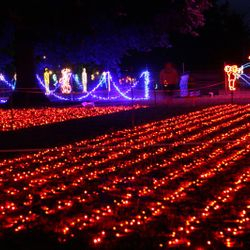 Started in 1998 with 10,000 lights the festival has grown in popularity and offers an experience you have to see to believe. 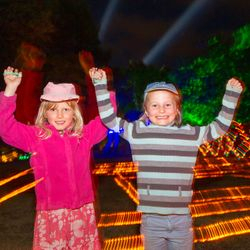 There's diving penguins, jumping fish, spurting whales and a host of colourful sea creatures amid thousands of dancing fairy lights animated precisely to music. The toyland display features larger than life toy soldiers, candy canes, bells, stars and teddy bears. 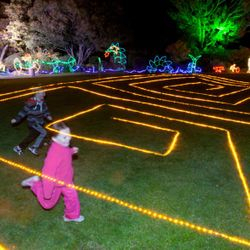 There’s interactive displays like the Running Man, the time tunnel for kiddies and the amazing ropelight labyrinth. Our nativity scene is 40 metres wide. 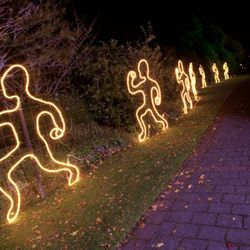 Other displays added include the spectacular Unison LED Ribbon Tree, Singalong/Runalong to the Twelve Days of Christmas Light scene and a delightful Peek a Boo display. Our stage is available for anyone to have a dance. Bring an Ipod/MP3 player/smart phone (anything with a headphone jack) and plug it in to our sound system. Then press play and start dancing! Or you can sing karaoke style to any song from “Frozen”. Or bring your own backing track so you can plug, play and sing. Choirs, quartets and duos entertain on selected nights. Toilets available. Our friendly staff members are there to provide help. The event is set-up and run by 150 volunteers. 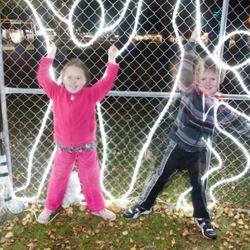 Gate sales goes towards adding new light displays each year. Funded by Hastings District Council, Hastings Creative Communities, Classic Hits 89.5, Unison, Firstlight Foundation and NZ Lotteries. Entry Fee: $5 all ages including New Year's Eve. Under 3 free. Parking. Free parking in the showgrounds.